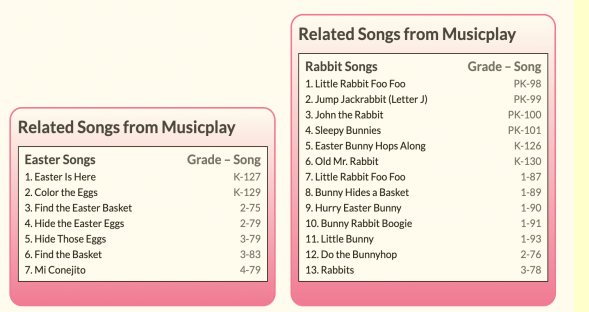 Did you know MusicplayOnline has a new Easter Unit AND a new Spring Unit? 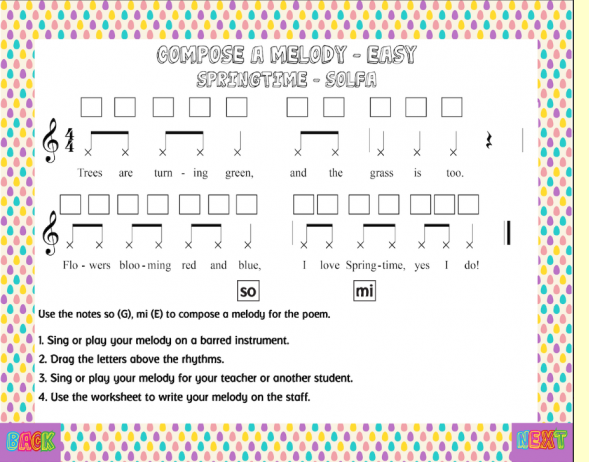 Compose a melody for Easter or Spring! There’s a so-mi version, a do-re-mi version and a drm sl or CDE GA version. 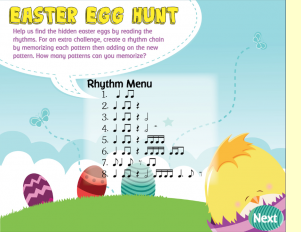 Practice Rhythms as you go on an Easter Egg Hunt! There are 8 levels of rhythm practice. And there’s a cute surprise after reading all the rhythms. 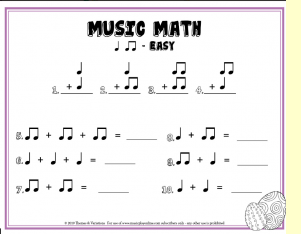 Want to have your students practice note values? 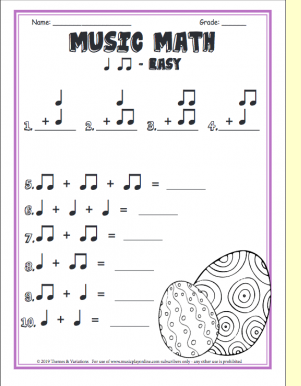 There’s a projectable Music Math activity with corresponding downloadable worksheets. There are multiple levels so you can choose the level that best suits your students. K-1 students: Shake the egg and see if they can guess what’s in it. I used an interesting variety of materials in the eggs including popcorn, rice, dried peas, small screws, tums, pennies. Gr. 2-5 students: Give each student one egg as they come in your classroom. Have them find the matching egg by listening carefully to the sounds their egg shaker makes. To make it easy to check if students have found their match, I marked the pairs — but most students don’t notice the markings the first time they do this. I also made a Key of what’s in the eggs, because it is hard to tell! 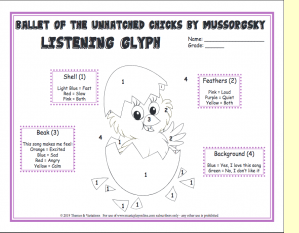 To introduce the piece in PreK-K-1 I have the children pretend they are chicks in the shell pecking their way out. It’s hard work, so when the long note comes, that’s when the chick is resting. View the kids demo! After active listening, have the kids complete the listening glyph. Enjoy! 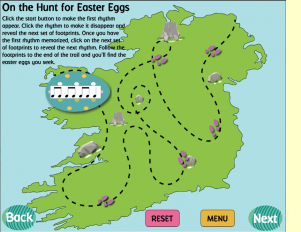 If you use the interactive Beat and Rhythm activities for Find the Easter Basket, you’ll see that our team has now created a menu for the activities. Now you can jump right to the activity that you want to do with the students. 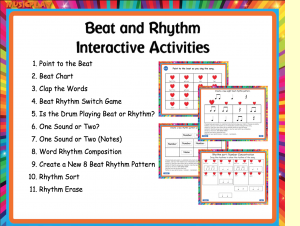 The new Beat Chart (activity 2) is new. Turn “off” the beats you want children to put “in their heads” and they sing out loud only for the beats that are “on.” Developing audiation is fun!!! The game is simple and fun! Kids make a line on one side of the room. Each time they sing “Yes Ma’am” they take a little jump toward you. (You’re Farmer Brown) . When you get to the end of the song, shoo the bunnies out of the garden. Print the vegetable cards and use them in the song. Then, clap the word rhythms. I put out 4 cards on the floor. My PreK closed their eyes and I clapped “sweet potato.” They correctly identified the vegetable I’d clapped. Sweet! A shout out to Dana Herro who performed this in her concert, having the students act it out. Instead of doing the fingerplay, when little Rabbit Foo Foo was hopping through the forest, they hopped. A great song to practice so-mi-do. Kids love chase games and they learn the interval because they’ve sung it in the game so many times. The Musicplay Team hopes that you enjoy the new Easter activities as much as we enjoy making them for you!!! 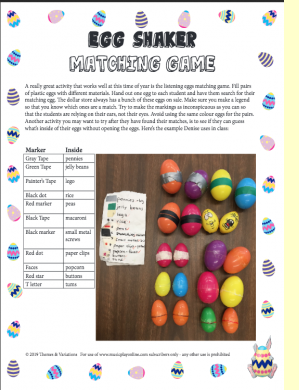 This entry was posted in Easter, MusicplayOnline Units, Spring, Uncategorized on April 8, 2019 by Denise Gagne.